Do you remember the deeeelish gingerbread men you use to eat as a child? Those scrumptious flavours and spicy kick! Well now you can enjoy all those flavours using spices you have in your cupboard, to make the easiest and YUMMIEST Smoothie. Its pretty much like a gingerbread party in your mouth. It tastes like it’s a dessert but it had immune boosting ingredients to help you fight off those nasty cold & flu’s. 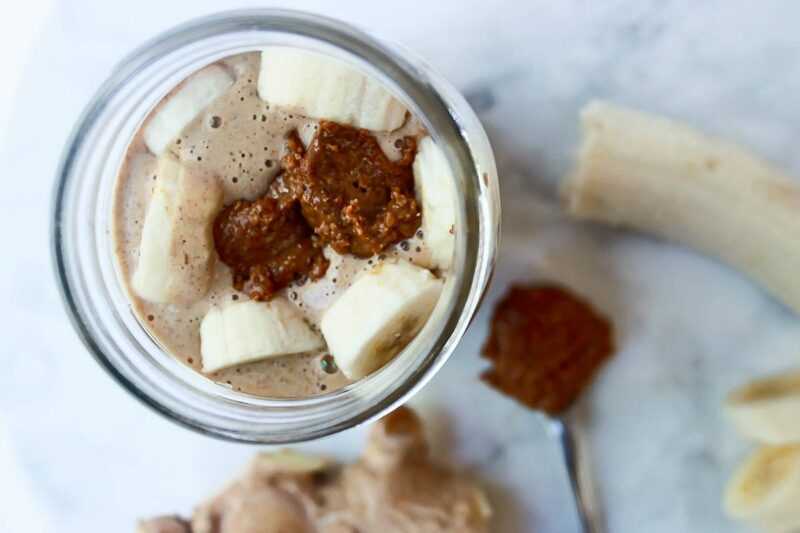 I used fresh grated ginger in this recipe, not only because its fricken yum and gives the best spicy kick to the smoothie but because ginger is well known for its warming effect on the body – aka warming up your insides to get things moving. It assists the body to breakdown toxins and purify the lymphatic system. Which is extremely important during winter so we don’t have a build-up of toxic waste that can compromise the body’s natural functions and weaken the immune system. Ginger is also a super hero when it comes to digestion, it can help ease bloating nausea and constipation, and finally THE most important reason we increase our ginger intake in winter, is because it fights of its antibacterial properties to boost the immune system and fight of all the bacteria bad guys! BOOM!!! So down this baby knowing you are strengthening your immune system whilst sipping away to a tasty treat! Add all ingredients to your blender/Nutribullet, blend for 1minute. So simple and you will be in Gingerbread Heaven!